Hello everyone and welcome to another video in our WordPress series. In this quick video I’m going to be looking at some common questions that often times come up with WordPress. Whether you are a beginner or experienced, you should learn a lot! So to start things off, if you’re thinking of starting to use WordPress, but don’t know the difference between WordPress.org and WordPress.com, let me explain. 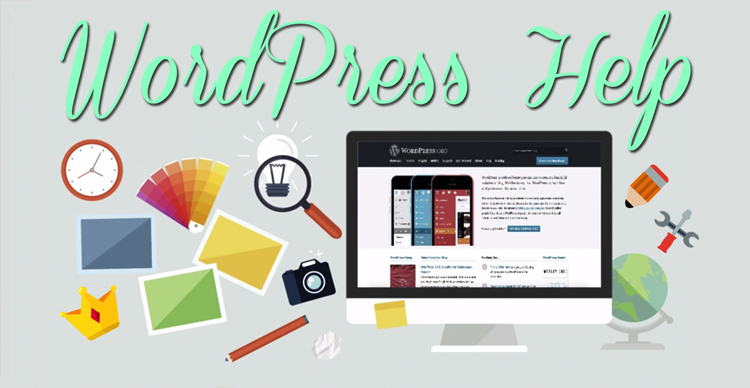 WordPress.org lets you have unlimited flexibility and control over your website. You can choose from thousands of plugins and themes to use on your website to enhance it’s features and functionality. With WordPress.org, you’ll find the ability to choose a hosting service and you can choose a domain name specific to you. The latter option is much more professional and very easy to use once you have done it, especially if you’re following our videos which guide you step by step! WordPress.com is much more restrictive. You don’t have the ability to have your own domain name and you don’t have the choice of thousands of themes and plugins to use. Ads are also placed on your website when using WordPress.com. You can’t use ecommerce and have an online shop and you have limited space to use images and videos. To create a successful fully functioning beautiful website, you’ll want to use WordPress.org to be able to make use of all the amazing free extras that come with it and have total control over your website! What do you need to create a website? 2 things. A domain name is the name of your website that people type in the address bar or into Google in order to find you. Hosting is just like renting physical space where you keep everything to do with your website. Simple! For hosting, we have used HostGator for years and we would definitely recommend them to anyone thinking of starting a website. They have 24.7 support if you need any help with your website, unlimited space and unlimited bandwidth! Unlimited bandwidth means you are not restricted by how much traffic you get to your website! The last thing you want is your newly subscribed visitors to not be able to use your website, they will most likely go somewhere else, so this is important to have. To login to your WordPress website is simple, just add /wp-admin/ at the end of your website name in the address bar. It’s like logging into the backdoor of your website, where you can then customize it how you like! If you are logged into your WordPress website, but you don’t see the Plugins menu on the left, then you may well be using WordPress.com which doesn’t have an option to use plugins. So, you’ll then need to register for WordPress.org. We have a super quick video that takes you step by step through this process over on our website! If your website is running slow and you want to speed it up, there are a few things you can do! First thing you need to consider is adding a caching plugin to WordPress. I recommend trying W3 Total Cache. Another thing is to make sure you have proper hosting. As I said before, HostGator is great and you will have unlimited bandwidth and space so your website should run much faster! Google Analytics is one of the most popular plugins to use with WordPress and for good reason! It’s absolutely fantastic! At a glance you can see who your audience is, who is using your website right now, what pages they like best, what they are using to visit your website, where they are from and lots more. All of this is free and invaluable to build a successful website and online presence. To use Analytics on WordPress we recommend the plugin Google Analytics by Yoast and we have a dedicated video which guides you through how to start using it. Check it out here! One question that comes up a lot is “How can I embed an image or a video in a post on WordPress?” Very easily! All you need is the image’s URL or the video’s embed code. So, for example, if you want to embed a video from YouTube, you just need this code that you can find beneath the video and just paste this into the post. Make sure you’re in Text View. Then add anything else you want. Contact forms are so important for your visitors to be able to get in touch with you or to be able to sign up to your email list. Using a lead magnet to do this is one of the most powerful and easy ways to grow your fan base from a few subscribers to thousands. Contact Form 7 is easy to set up and use to create a contact form on your website. We dive into a detailed step-by-step video here! So be sure to check it out! Search Engine Optimization (SEO) is a video series on it’s own. It’s very extensive to cover, but at the same time, you can start using it in just minutes using our guidance and a nifty little plugin called WordPress SEO by Yoast. SEO is a strategy, a set of techniques and tactics to increase the amount of visitors to your website. SEO best practices works by obtaining a high ranking in search results such as on Google. You can use keywords, meta descriptions, titles and tags to give your website a better chance of being highly ranked by Google. Since this area is so important we’ve dedicated an entire video to this awesome game-changing tool! Definitely check it out here! If you’re struggling with WordPress whether you’re a beginner or advanced, if you can’t log in, if you can’t get your posts to come out right, we are here to help you! We’ve helped thousands of people become more confident with WordPress using our quick and easy to understand step by step videos. I hope you have enjoyed watching! And if you did, please give this video a quick like. If you’d like to see more videos, then subscribe! And if you want to be super awesome, then please share it with someone who you think it could help! Thank you and see you in the next video!